Brand New!! 2 Year Factory Warranty. Fold Down Rear Seat, 14" Aluminum Wheels with 23" Off-road Tires. 13.5 HP Kawasaki Gas Engine. Headlights, Tail Lights, Brake Lights And a Horn. Are Golf Carts Street Legal in your town? ADD OUR STREET KIT: This kit comes with a Turn Signal Switch, Brake lights, Horn, Rearview Mirror, Rear Safety grab bar, Front Reflector, and Rear Slow Moving Vehicle Placard. Some towns require a windshield or seatbelts which we also have available. We are familiar with the ordinances which allow street legal use of your golf cart in all these surrounding towns: Manteno, Momence, Peotone, Clifton, Chebanse, Ashkum, Watseka, Herscher, Dwight, Saint Anne, and many more! We have thousands of Accessories and parts available which we can easily add to whichever cart you choose. If you can think of it, we can do it! We strive for customer satisfaction and we can prove it. Search for "Stevenson Auto Sales reviews" to find out what our customers have to say about us on Facebook and Google. If you don't already have a bank or credit union we have partnerships with local and national lenders to offer the most competitive rates. Fill out our online credit application to find the payment that fits into your budget or call to set an appointment now. 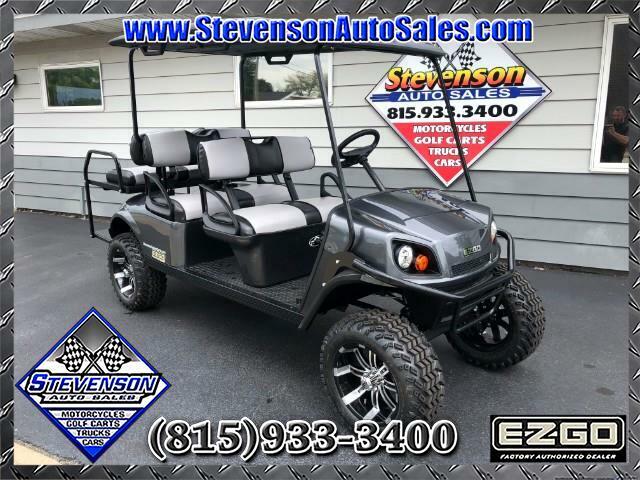 Message: Thought you might be interested in this 2018 EZGO Express.